A few months back I posted a press release for the new Xikar Allume series. I finally got my hands on the one I wanted to review. The Allume series is the replacement for the XTX line-up, which was a huge success for Xikar. Xikar went with the traditional colors as well as bold colors. Nice to see Xikar present a series totally different option wise than the standard old black, silver, gunmetal, etc. It only seems fitting then review the brightest and boldest in the series. 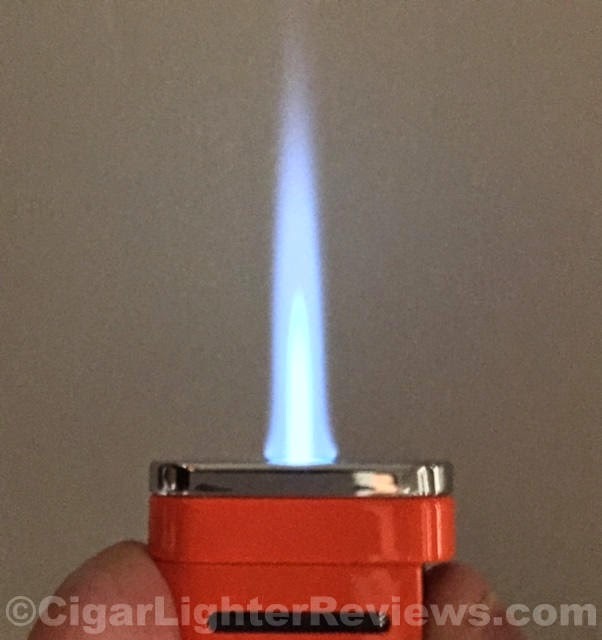 This is the Allume single torch lighter. 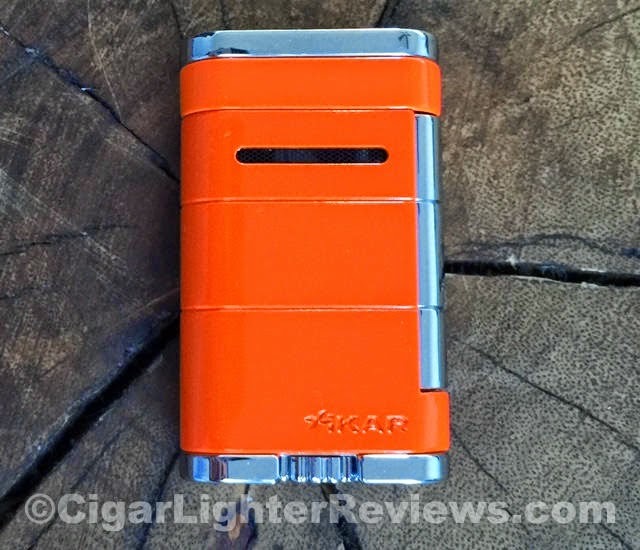 Shown in a blistering orange, Xikar calls "crush". The pictures do not do it justice. Think of the bright orange spray paint construction workers use, pretty darn close to that color. Allume is available in a staggering 8 total color/finish variations, from traditional to bold. This new series from Xikar is extremely similar to the XTX series now retired. A slight cosmetic change with the vents on either side now being straight horizontal cut outs. Also, I believe the mechanics with the lighter have been improved for more reliable/less downtime under warranty repairs. Remember, lifetime warranty, with no proof of purchase with Xikar lighters. I have said it hundreds of times and will again, the best in the business. The side pusher snaps inwards firmly and confidently. A nice "click" is heard, followed by the lovely sound of a powerful single wind resistant flame. Xikar is using the ever popular and more reliable Piezo ignition system. I am usually a dual or triple flame guy, but I find myself rather fond of this little lighter. The dimensions of the single torch Allume are 1.3" width, 2.15" tall, and only .5" thick. This little powerhouse also has some weight to it considering size, coming in at roughly 2.02 oz on my scale. 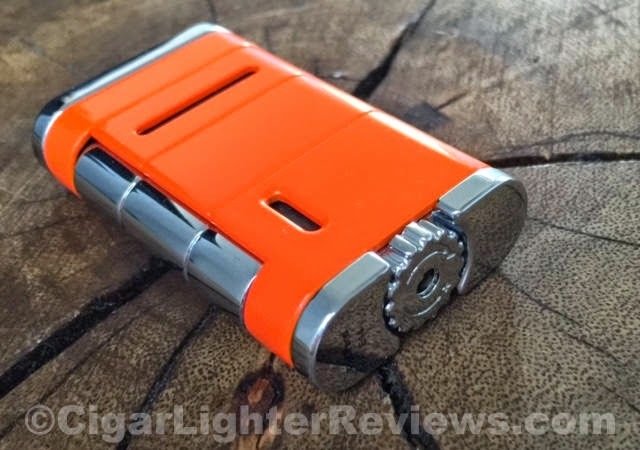 It has Xikar's signature oversized fuel adjustment wheel and a nice little fuel gauge window. Considering the compact size of this lighter, I will not knock the single torch Allume lacking an integrated cigar punch cutter. All in all, this lighter is a winner in my book. Given all the color options, great compact size, and reputation that comes with owning a Xkar (warranty), it's hard to go wrong with the single torch Allume. Suggested retail price is $59.99.